PORTLAND -- A state board will investigate whether a Beaverton teacher was on his own time or using state resources while he organized liberals to crash Oregon tea parties. 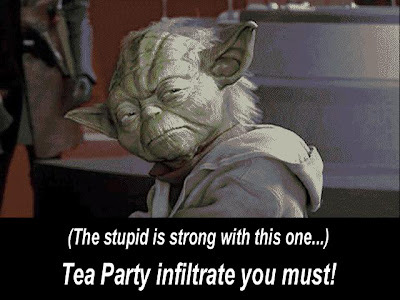 Levin has gotten national attention for a "Crash the Tea Party" Web site that called for opponents to infiltrate the events and behave outlandishly. That raised suspicion he was doing political work during schools hours. When asked for what reasons, she said we all know what it is." The Oregon Teacher Standards and Practices Commission opened an investigation Wednesday. Jason Levin holds up a shirt he was going to wear to blend in with Tea Party members during the movement's protest on Tax Day, but after his face was posted on the Internet he had to shelve his planned appearance. "we all know what it is." In other words, he’s been given a paid vacation! Now THERE’S a strict school district. What government officials call "paid administrative leave" most of us know as a vacation. Hopefully he gets put on permanent unpaid administrative leave, also know as being fired. Looks like Jason has put on a few pounds. He got the day off to go work on his protests. With pay. He’s truly sorry... he got caught. Only as a member of a modern union can an employee abuse the employers resources, then be rewarded for it with a paid vacation. It should take the District IT Director about 15 minutes to determine whether or not he used District resources for this. Oh wait, I assumed that a School District IT Director was competent. Check that. If he or she is anything like the District IT Directors I've dealt with it will take months if they're able to do it at all. They'll have to hire a Consultant for 50 grand who will then release an RFI so he can charge the District another 50 grand to write an RFP. Perhaps in a year 3 candidate vendors will be identified who may be able to recover that data. After that it will take the District another 180 days to actually pick someone to do the work. It’s real simple: this man encouraged people to make racist, anti-gay remarks. Isn’t that a hate crime? PAID leave.....real punishment there!....Just gives him an excuse to cause trouble and not worry about teaching!! Once again, honest tax paying citizens paying for radicalism! I read a report that he is claiming to have used a thumb drive to take web work home from the school and that is why some of his source code has school identification on it. I believe this all started as an internet money scam to separate gullible liberals from their money via Pay Pal. Then the news media got hold of it and have pushed it hoping to incite violence between political factions. When Levin's face got on national news he had to pretend he was for real. The Oregon state agency responsible for consumer protection on the Internet should investigate this operation. Well, now we know he wasn’t there. LOL!